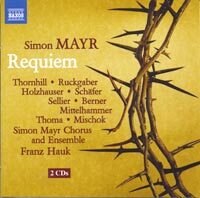 SIMON MAYR (1763-1845): Requiem in G Minor. Description: When this 116-minute Requiem was composed is unknown and the version performed here, using autograph manuscripts, is bigger both in scale and instrumentation than a second Requiem which was published around 1820. Church style and more Romanticized elements are finely balanced in this important example of Mayr’s compositional style (and, some sections were composed by Mayr’s student Donizetti and corrected by Mayr!). Siri Karoline Thornhill, Katharina Ruckgaber (sopranos), Theresa Holzhauser, Brigitte Thoma (altos), Markus Schäfer, Robert Sellier (tenors), Martin Berner, Ludwig Mittelhammer, Virgil Mischok (basses), Simone Mayr Chorus and Ensemble; Franz Hauk.